Our goal is to provide you the answers for your favorite games. We have a lot of answers for different games available which you can find by your favorite search engine or by searching for the game in the search box on this page. If you are looking for some answers which you can’t find then please contact us via the contact page so we can see if we can provide the solutions for you. You can search for words with letters for every kind of word game. Just enter all your letters below and see all the possible words you can make with them. With this possibility you will win every Crossword, Scrabble or other kind of word game! We hope you enjoy playing your games and solve your levels with our help! 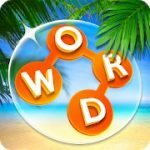 Wordscapes is a very popular game with nice graphics. With the letters you get each level you need to find all the words. Swipe the letters and create words. And we have the Wordscapes answers for you if you can’t find them.